LCMS Plus is now DaVinci Education. Meet Leo. Our powerfully insightful healthcare education platform. Designed to address the inefficiencies that result from using too many systems to do too many things, DaVinci Education offers the most fully-integrated enterprise platform available for health sciences education. From course management to curriculum mapping, from assessment and evaluations to patient encounter logs and lotteries, from faculty effort tracking to the Academic Portrait® — Leo helps you run your entire educational program from a single platform. "I've got discussions, exams, coursework, calendars … there's so much to deal with, but it's all over the place!" That's why Leo gives you one platform to access it all, so you can spend less time figuring out what to do, and more time actually doing it. Leo puts your personalized calendar at the core, giving you one place to access everything you need to stay ahead of the curve. Download all your materials for a given time period with just a couple of clicks. See whether an event is mandatory or has a dress code, what the learning objectives are, who's teaching and more - all with a single glance at the calendar. "I'm so busy trying to teach and advise students, I need technology that doesn't get in my way." Simple and straightforward, Leo is here to support your educational efforts, not interfere with them. Easily map session objectives to program objective and competencies. "I'm trying to manage small groups, clerkships, lotteries, grades, evaluations… and now a site visit?!" We know exactly what it’s like to be in your shoes, because we've been there. And we can help you simplify things. "I wish our program could be accreditation-ready, always." 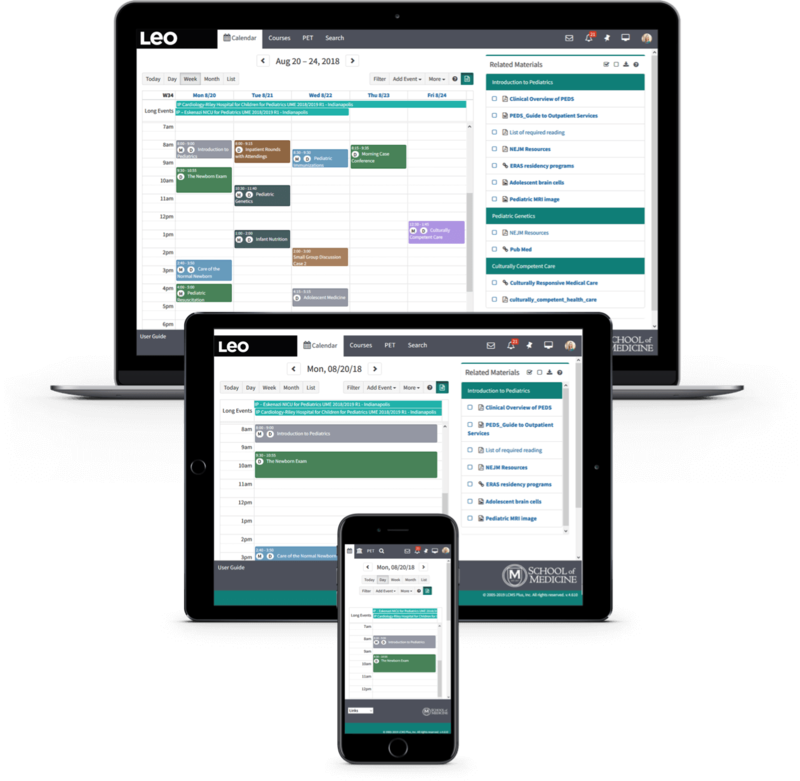 The real-time information in Leo allows you to understand the relationship between your program objectives, competencies, and many other elements to give you the big picture of your educational program. "Our IT department is slammed - how much extra effort is this going to require from us?" Not very much at all. We manage the backend so that you can focus on your other mission-critical tasks.